This makes cloth diapering easier. I love it! I cloth diapered for years without it with no trouble, but now that I have one, I do like it a lot, and I honestly won't go back to my old way. This is easier! 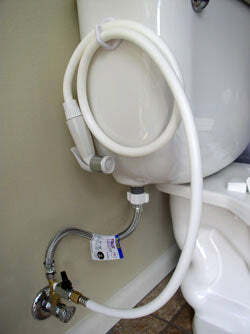 it's a neat and well thought-out gadget for spraying off diapers into the toilet. It's easy to turn off the valve off when not in use to ensure leak prevention. In some situations, such as common laundry or laundromat users, this can make washing much easier and faster. If you have a low-water toilet purchased after 1994, you might really need this. It's hard to dunk a diaper in a toilet that has hardly any water in it. This is the solution for those low water toilets. It definitely reduces diaper pail odor! I also love this for spraying poop off the edge of my covers so they can more easily be washed with my clothes separately from the diapers. This way my covers last much longer, since I'm able to wash them more gently more easily. I also use this to clean poop off wool effectively if it's just on the edge, without having to wash the whole wool cover. I'm totally spoiled now that I have a Potty Pail! It has it's moments of still being useful even as the kids get older for cleaning dog messes off the bottom of shoes, etc. When you click the Potty Pail image link above or below, you will leave Green Mountain Diapers. We are not an affiliate, and do not sell them ourselves, but please visit our friends at The Potty Pail for Made in USA quality. 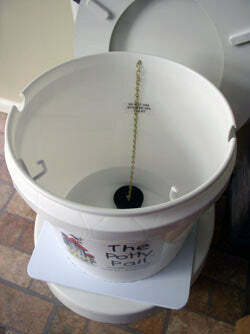 If you like this idea, I highly recommend the complete system, including the pail because it prevents splashing. But if your bathroom is tiny, check out the sprayer without the bucket shown below. Quality is really important in a diaper sprayer. Why? You do not want a leak or a flood! My husband refused to install the first small sprayer that I purchased because all of the fittings were plastic. But this sprayer is quality. Brass fittings. It's the good one. While the complete system with the bucket is great if you have room for it, if you can't get that system, this is the the one to get. We turned the valve off when not in use to ensure leak prevention. "Having the right tools for the job makes all the difference." You will leave Green Mountain Diapers when you click on the image link. We are not an affiliate but we like this product so much that we recommend it. We tried all of the sprayers on the market that we could find, and this our favorite.